The bathroom is a great place to start going green: Using ecofriendly fittings for an average bathroom upgrade can save 7,000 gallons of water per annum. That's equal to one inch of rainfall (almost 30 tons of water) on a 60' by 180' piece of land. You can save loads of water and money without sacrificing style, function or value. As consumer demand for green products has grown, plumbing fixture manufacturers have begun offering more high performance but beautiful alternatives. So, if you’ve been meaning to make the switch, there’s never been a better time to start the upgrade to a green lifestyle. You can turn your greenbacks into green bucks by picking environmentally friendly choices when remodeling. There are some exciting, cutting-edge, ecofriendly faucets, showerheads and toilets out there. Shower technology has improved in leaps and bounds in recent years. From entry-level models – which offer a single spray pattern – to extra-large hand showers complete with a selection of spray patterns, there are showerheads with a variety of water saving features to fit your personal and design requirements. 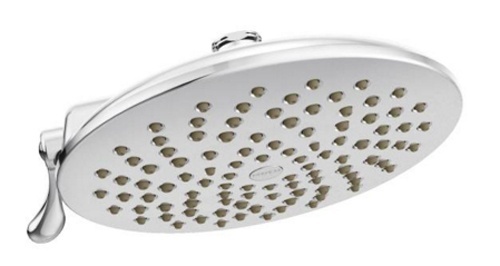 Love your showerhead and don’t want to change? You can keep the shower and reap the same benefits of the technology by fitting a Smartshower TSV adapter in line with another showerhead. Both result in up to 2700 gallons of savings per year. 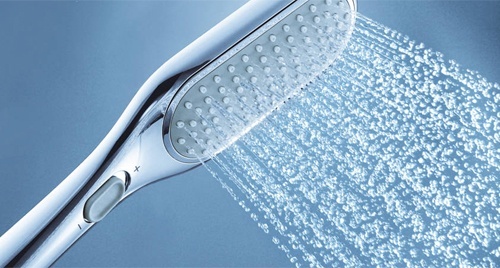 Not only are you saving water, but you’ll get an audible signal when your shower is up to temperature and ready to go. 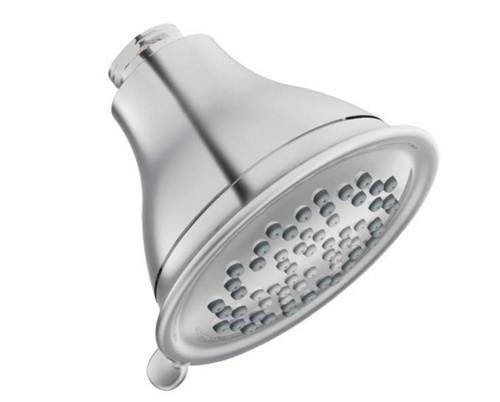 The more traditional way to reduce water usage in a shower is with a low-flow showerhead. Many of these reduce water consumption by 30 to 60 percent, without sacrificing pressure. One person taking an adequate daily shower, most days of the month can save over 2,000 gallons per year. A "super shower" that conserves water might seem counterintuitive, but green-minded homeowners can have their high-end shower and still be kind to the planet. Moen's line of Eco Performance showerheads reduce the flow of water, while providing a satisfying shower experience with "Moen Immersion", which speeds up the rate at which the water comes out of the shower. The Envi Eco-Performance Rainshower, an eight-inch rain showerhead, uses 20 percent less water than the industry standard. This doesn’t just save water; it allows you to customize your shower experience. A handy lever easily fine-tunes the water delivery from the spray nozzles. This lets you choose a more powerful shower where the flow is concentrated into 30 nozzles for a revitalizing rinse. On the other hand, a softer shower where the flow can be expanded to as many as 100 nozzles provides that fresh, rain-drenched tingle. Water-saving features such as Grohe's Eco buttons allow you to "dim" the spray on your handheld, so that you can decide when you want "low flow" or when you want the maximum spray. Their Ecojoy series, such as the New Tempest Ecojoy all help reduce your water usage, while silicone nozzles help to prevent the buildup of lime scale. Another clever product is Grohe's Eco Rain Shower, intended to mimic the shape of a human from above, with a lozenge shaped handheld head. It's designed to save water by putting it where you need it, and not in the rest of the shower. Manufacturers have gotten much better at balancing water conservation and performance. The correct bathroom faucets can reduce your sink's water flow by as much as 30 percent and deliver a strong steam in the process. In the average home, this can save up to 500 gallons of water every year. Adding an aerator to the bathroom faucets will decrease water flow even further while keeping or increasing water pressure. How about a touchless faucet? Touchless faucets allow you to save water by turning on and off when you need them, and you can preset the water temperature. 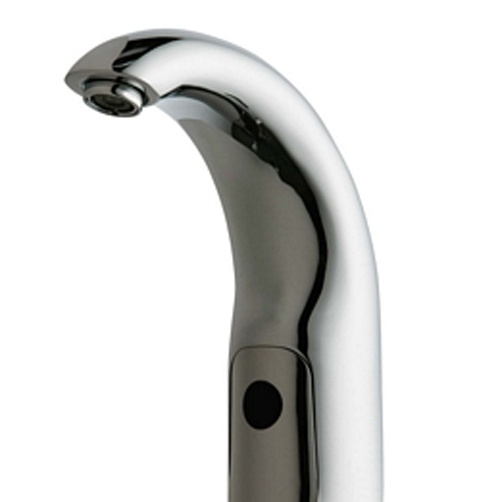 Chicago's Hytronic Contemporary Sink Faucet is a great example of function and beauty. Fancy something a little more conventional? As part of their Ecojoy series, Grohe's bath faucets offer single-lever basin mixers that use a flow-limiting mousseur with aerator. This reduces water usage without affecting performance. The result is a substantial, voluminous flow that never exceeds 5.8 litres per minute. By adding an adjustable temperature regulator, which can be set to your requirements, energy consumption is reduced even further making this choice as kind to the environment as it is to your pocket. 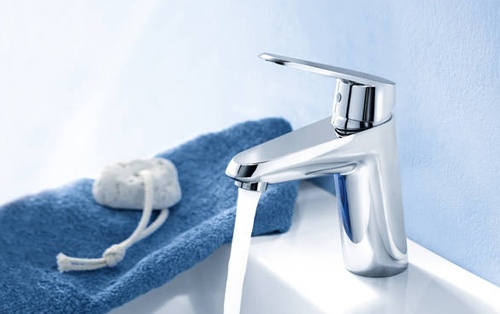 Tip: No matter how economical your faucet, don't forget to turn off the tap while brushing your teeth. Leaving the water running while brushing can use as much as 5 gallons! Some estimates say that 30% of household water is flushed down the toilet, quite literally money down the drain. Upgrading can save you up to 4 gallons per flush. Pre-1995 toilets used anywhere from three to seven gallons per flush. All toilets sold in the United States since 1995 are new "low flow" and use 1.6 gallons of water or less per flush. If you still have one of those dinosaurs, change it out! A dual-flush toilet is a variation of the low-flow toilet that uses two buttons or handles to flush different levels of water. You select the amount of water needed for the job; dual-flush toilets have been proven to save about 67% of water usage in most homes. 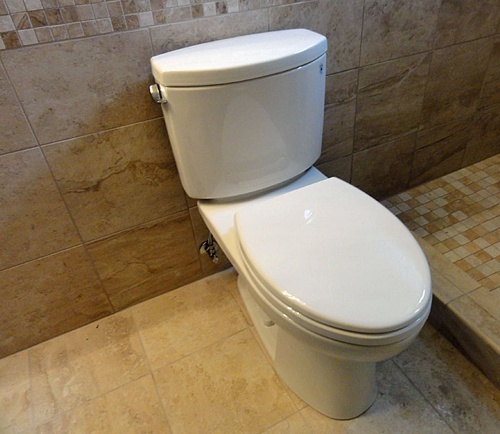 A family of four with an older toilet will use about 26,000 gallons yearly. The same family with a dual-flush toilet will use approximately 11,000 gallons per year, a savings of 15,000 gallons per year. 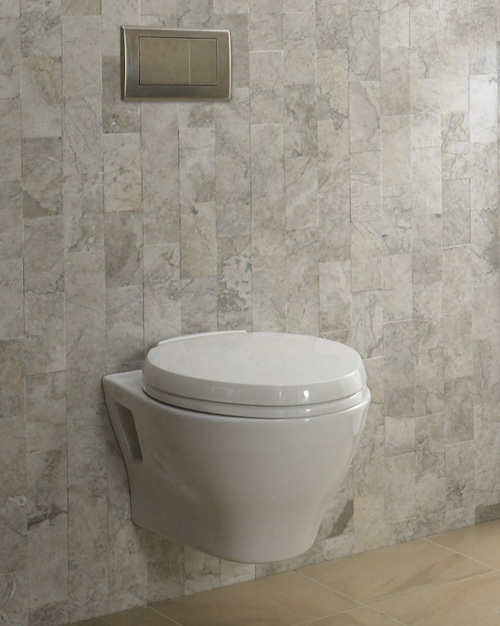 In the Clark Construction showroom, we have the Toto Aquia Dual Flush. It's very attractive, but Consumer Reports favors a less expensive dual flush, the Glacier Bay Dual Flush N2316.High Efficiency Toilets (HETs) use 1.3 gallons for each flush. With an HET, a family of four uses about 9,000 gallons (34 m3) per year in total toilet water use, savings another 200 gallons per year. High Efficiency Toilets (HETs) use 1.3 gallons for each flush. With an HET, a family of four uses about 9,000 gallons (34 m3) per year in total toilet water use., savings another 200 gallons per year. 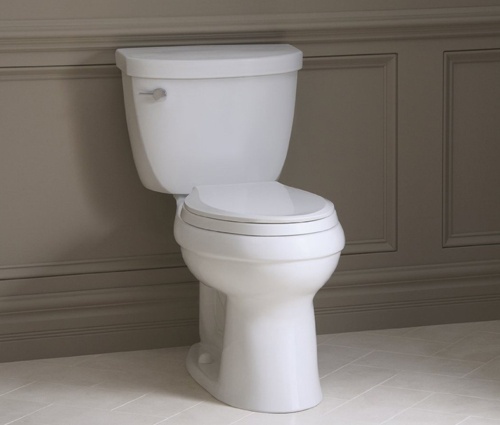 One good model is the Kohler Cimmaron Model K-3609-0, known for its comfort height seat, and its ability to flush with just one flush. Of course, the savings of less-water-per-flush is eradicated if a toilet has to be flushed multiple times! Environmental Product Declarations (EPDs) provide quantitative, third-party-certified details of a product's projected environmental impact from cradle to grave. Manufacturers are starting to provide these, so you can make informed, environmentally conscious choices when selecting plumbing products. Kohler is one of the leaders, and you can find more info here. As water levels run low due to global climate change, people are beginning to make a conscious effort to decrease their impact on natural resources. 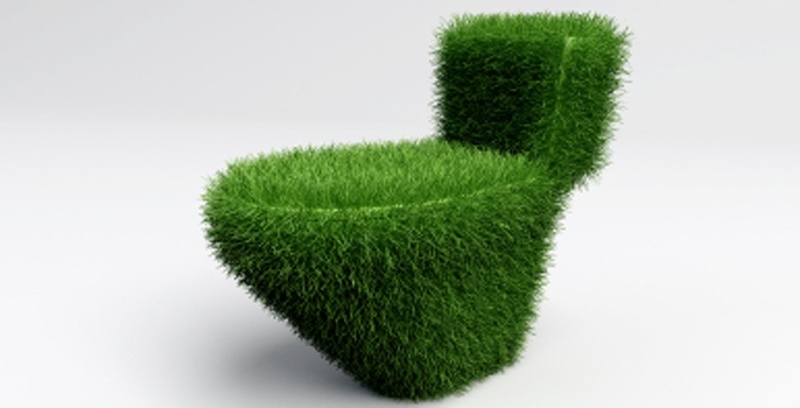 Using the ecofriendly green components that perform better than non-green alternatives increases the value of your property while lessening your environmental impact dramatically. Changing out fixtures for ones that are earth friendly will directly ease your bathroom's impact on the environment (and your wallet).